One aspect of Virginia’s architectural history that is not represented in the Commonwealth’s surviving stock of historic buildings is Colonial-era slave quarters. Slave quarters, buildings designed and constructed for the express purpose of housing slaves on Virginia plantations, once existed in the thousands. However, these structures typically were built cheaply of perishable materials, and the large stock of such buildings that stood in Virginia prior to the Civil War rapidly decayed and disappeared from the landscape once slavery died as an institution. A late-17th-century slave dwelling, based on an archaeological site in James City County, is re-created in the Jamestown Settlement galleries. 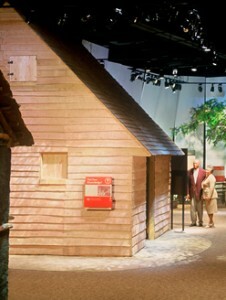 The re-creation includes an interior storage pit, a distinctive archaeological feature of slave quarter sites, and examples of artifacts found at Virginia slave quarter sites are exhibited . Only a handful of slave quarters, most dating to the 30 years immediately prior to the Civil War, still stand in the Commonwealth. It is likely that none of the surviving quarters date as early as the Colonial period. However, the tradition of constructing slave quarters extends back at least a century before America achieved independence. Fortunately, although Virginia’s Colonial-era slave quarters have disappeared from view; the evidence of their presence is still with us. Archaeological excavations and historical research can uncover this evidence and allow these early slave quarters to stand again, at least in the mind’s eye. The earliest buildings in Virginia that can be identified as slave quarters seem to have been built near the end of the 17th century, when the slave population of Virginia began growing very rapidly. The first written references to separate dwellings for slaves also date to this post-1675 period. We don’t know how early the practice of housing African slaves separately from other plantation workers came about in Virginia, but it seems that slave quarters had become a recognizable class of plantation outbuildings before the 18th century began. In the late 17th and early 18th centuries, slave quarters, like most other Virginia buildings, seem to have been wooden post-in-the-ground structures. The framework of such buildings was supported by vertical posts sunk into the earth, and the roof and sides of the buildings were made of hundreds of thin wooden boards, or clapboards, nailed in overlapping horizontal rows to the building’s frame. Slave quarters were built in much the same way as the houses of poorer white Virginians, who also lived in small post-in-the-ground structures. In the second half of the 18th century, a new way of building slave quarters became increasingly popular. Instead of constructing post-in-the-ground wooden frame quarters covered with clapboards, planters began to favor slave quarters built out of logs. These log quarters were built like log cabins, and lacked either a foundation or an internal wooden framework. Like the earlier post-in-the-ground quarters, these log buildings were mostly small one- or two-room dwellings with dirt floors. In the years immediately after the American Revolution, Tidewater slave quarters changed very little in physical design, but the tobacco-focused plantation economy they had been created to serve was in serious trouble. As the 18th century gave way to the 19th century, the shrinking role of tobacco as a cash crop in the region coupled with rising anti-slavery sentiment encouraged both the manumission, or freeing, of slaves and greater use of slaves in craft, service and even industrial activities. For Tidewater African-Americans, the traditional slave existence as a gang laborer on a tobacco plantation was no longer an inevitable fate, although thousands still spent their whole lives in this condition. Modern-day historians have come to realize just how important the quarter was, both to the development of slavery as an institution and to the evolution of African-American culture in the American South. Even though the slave quarter was a structure created to meet the plantation owner’s aims, it was the slaves themselves who shaped the quarter as a functioning space. By the very process of living in a slave quarter, slaves made the quarter a vehicle for the expression of their own beliefs and aspirations. Particularly during the late 17th and early 18th centuries, when many slaves were recent arrivals from Africa, the quarter must have been the focus for a very complex set of cultural interactions and mediations. In responding to the challenge of life in the quarter, Africans became African-Americans, forging a new way of living from elements of their past and present experiences. Ultimately the quarter, a structure created by planters to control slaves, became something quite different, the wellspring of a new African-American way of life.